Leaving Africa was sad, but the idea of getting to see Stacia and Ray was more then enough to cheer me up. The 3 of us had worked together while I was living in California and have not seen each other in ages! I flew from Malawi to the Congo, to Ethiopia, to Italy (where I placed an awesome collect call to ma and pa) and finally arrived in Madrid on February 1, 2012…exactly one year after leaving Toronto and starting this crazy adventure. After having been without internet for a while, I dropped my bag at a hostel and immediately started up Skype. I can’t imagine how people did this whole travel thing before communicating with family was this easy. Early the next morning, I threw my stuff into my bag, checked out and ran two blocks to the apartment that Stacia, Ray and I would be calling home while in Madrid. I had just arrived and set my stuff down when I looked up and saw these two crazy Americans standing at the door. I was a bit overcome with excitement and launched myself at them with hugs that were probably just a little too long and awkward, but I was thrilled to see them! We headed out to explore a little of the city and get our bearings. The first place we went was a nearby cafe to get filled up on caffeine. From there we were off to Plaza Mayor (the central plaza) where we found some bizarre people in costumes that could only be described as ‘Glitter Yaks’. I am still totally clueless as to what they were or why they were there, but we got some good laughs out of their randomness. That evening, thanks to the delight that is Casa Lucas, we discovered the true beauty of tapas and wine. However, eating delicious food and drinking tasty wine contributed to the jet-lagged exhaustion of our little group and we ended up sleeping through our wake-up call to get to our morning train for Segovia. We took that as a sign that we should enjoy our breakfast and just catch the next train. Unfortunately, we enjoyed our meal a little too slowly and ended up missing our next train as well. After being on the road for the past year, I am pretty used to plans changing like this but I was totally impressed by how well Stacia and Ray dealt with this bump in the road. We decided that we would simply go to Segovia the following day and instead visit the premier wine shop of Madrid then head to the Museo del Prado (it turned out to be free night there!) and get some more tapas. 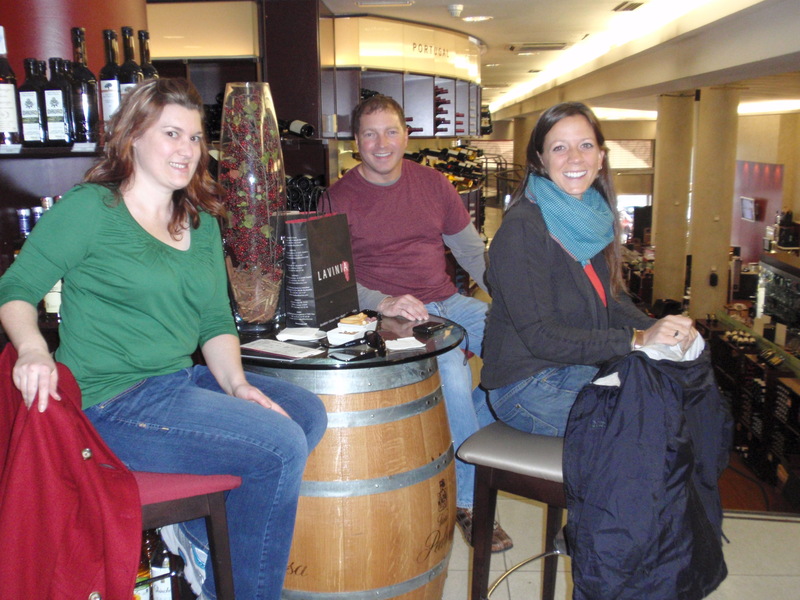 The wines shop was a bit overwhelming and awesome, so we bought a bunch of bottles and sat down to taste one of them. There was a small incident involving Ray and a bottle leading to a whole day of “He threw it on the ground” comments (see The Lonely Island for that quote). 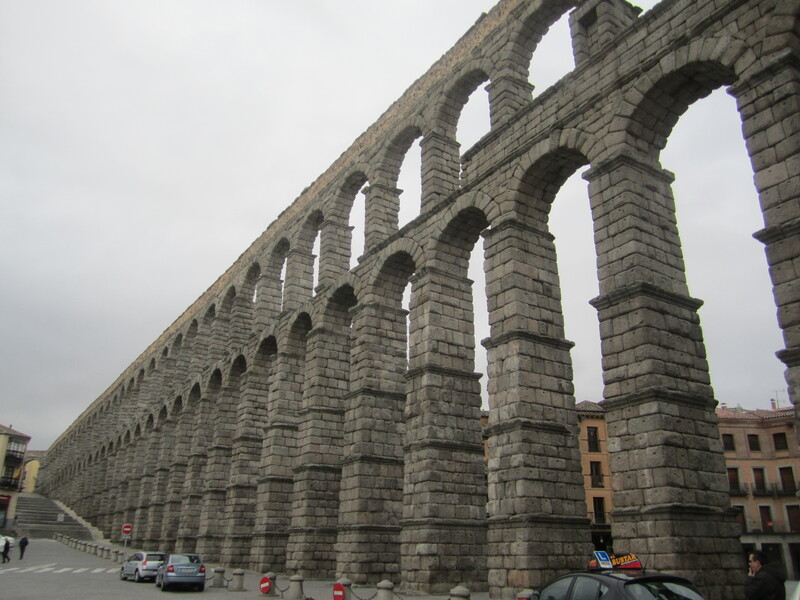 Somehow, we managed to make it to our train the next morning and headed off to the World Heritage City of Segovia. Here, we wandered under the impressive Aqueduct, visited the last Gothic cathedral to be built in Spain, and headed into the Alcazar of Segovia which was the favourite castle of the Kings of Castile. From the roof we had an incredible view of the villages dotting the surrounding hills. It was made even more magical when a light snow started to fall, dusting everything like confectioners sugar. We had worked up quite an appetite so it was time to try some suckling pig. The name had me a little weirded out at first, but it was delicious! Back in Madrid, we headed to the Chueca area of town for a wander and some more tapas and wine. The theme of yummy food and good wine had definitely already taken root with our little group and I was loving it! 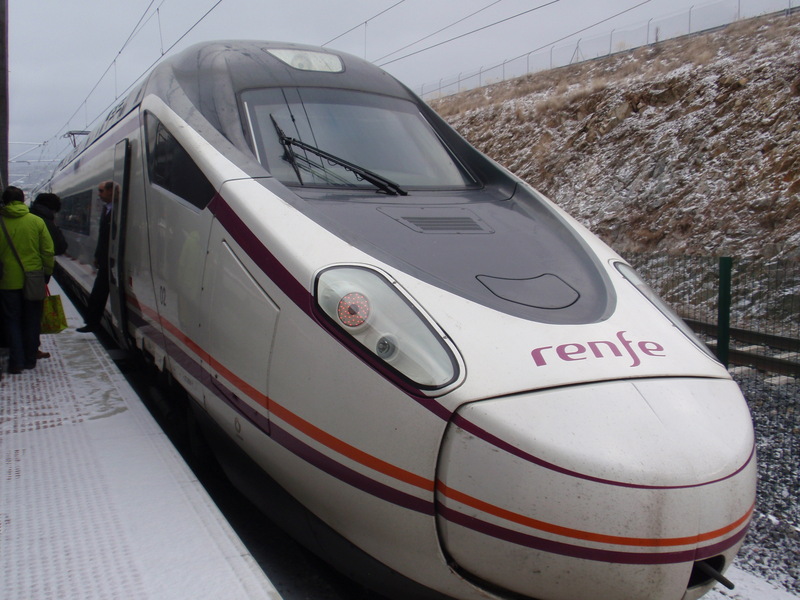 Sadly, it was time to say Adios to Madrid and catch the super fast train to Barcelona. We arrived at our new little home and headed out on the town for…that’s right…tapas and wine! 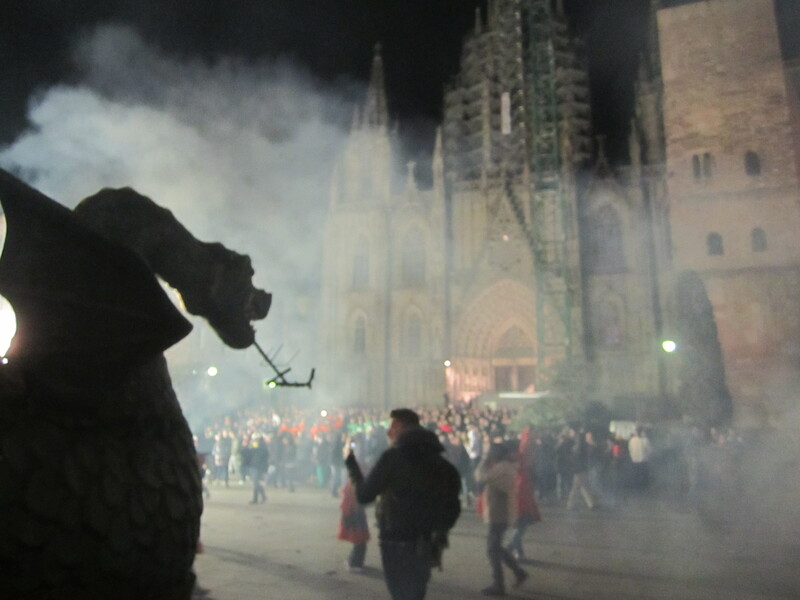 We then trucked over to the Picasso Museum, which it just so happens was also having their free night. We were scoring with the free attractions in Spain! The next day something beautiful and wonderful happened. We discovered the Menu del Dia. At lunch, many of the restaurants put together a fixed 3 course menu with some options (including wine) for a rock bottom price. We ate like kings! This continued until the day I left Spain, and because of it I was a bit concerned that none of my clothes would fit me much longer. Up next on the timetable of awesomeness was the Sagrada Familia…the last project of Antoin Gaudi who was killed by a tram before it could be completed. Although it is still not quite complete, it has been declared a World Heritage Site and was consecrated by the Pope. If you have never heard of this building, I highly recommend looking it up because no description I can give will ever do it justice. 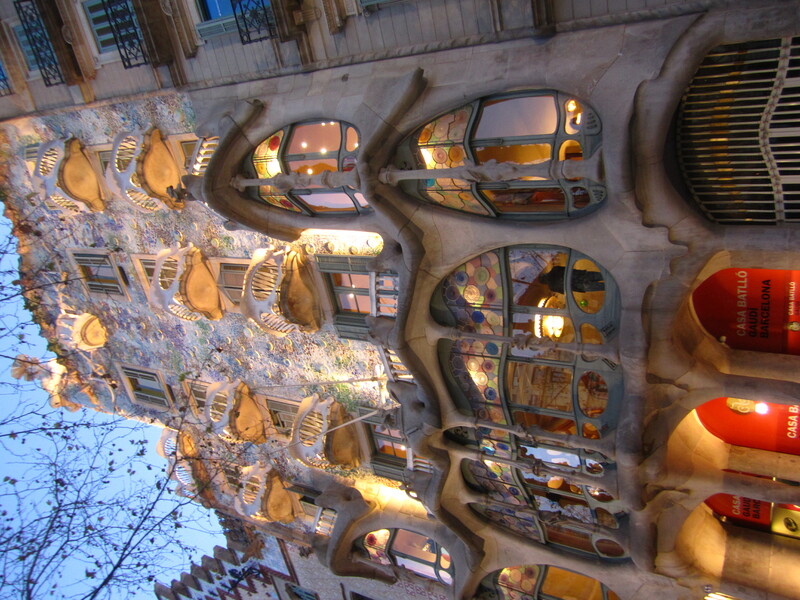 Gaudi envisioned it to resemble a forest, using Gothic, geometric, Catalan Modernism and art nouveau design elements. Although George Orwell called it “one of the most hideous buildings in the world” I was absolutely blown away. It was a very whimsical and joyful place which, after having seen too many churches to count in the last year, I can honestly say is refreshing and rare. This was certainly one of the highlights for me. When we left, we were on a bit of a Gaudi high, so we headed over to his Casa Mila and Casa Battlo for check out his earlier designs. The next day we marched ourselves all over town and definitely earned our Menu del Dia joy. We began on La Rambla to check out the tourist shopping area as well as the Boqueria market, then headed out for some super delicious hot chocolate that Stacia had researched…what a great girl she is! Ray made friends and managed to score us some free wine before we hit the town to do a little shopping. Wine and shopping always go together very well! We managed to find Ray the worlds most perfect scarf, a couple of pairs of espadrilles for Stacia and some beautiful cupcakes for all of us. The following day, Stacia and I decided we absolutely must have some churros. So off we went in search of our child-like breakfast. This turned into the only disappointment of the Spanish experience. They were terrible! Luckily, we had another amazing day to wipe the memory of these from our minds. 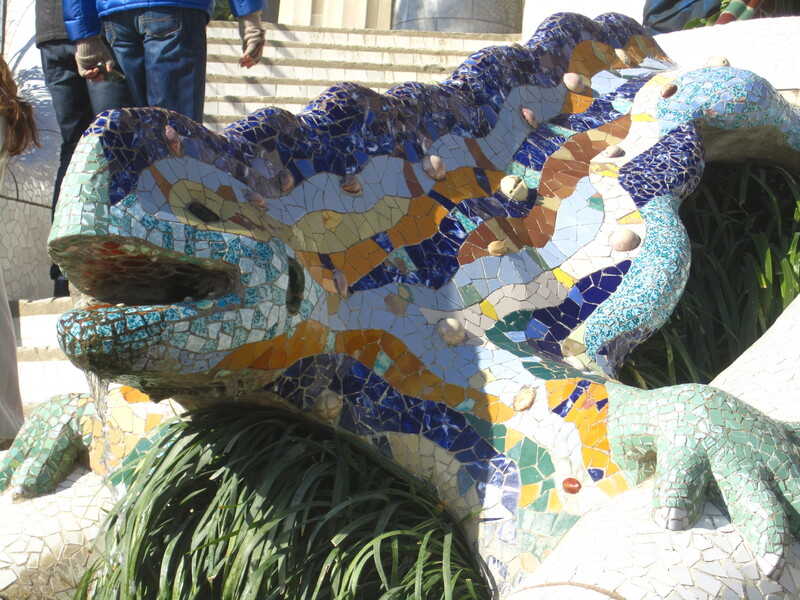 Today we were revisiting our Gaudi experience with a visit to Parc Guell. Gaudi had been commissioned to created a garden park housing site for the richy-rich just outside of Barcelona. However, the city has grown and it now lies well within the city boundaries. 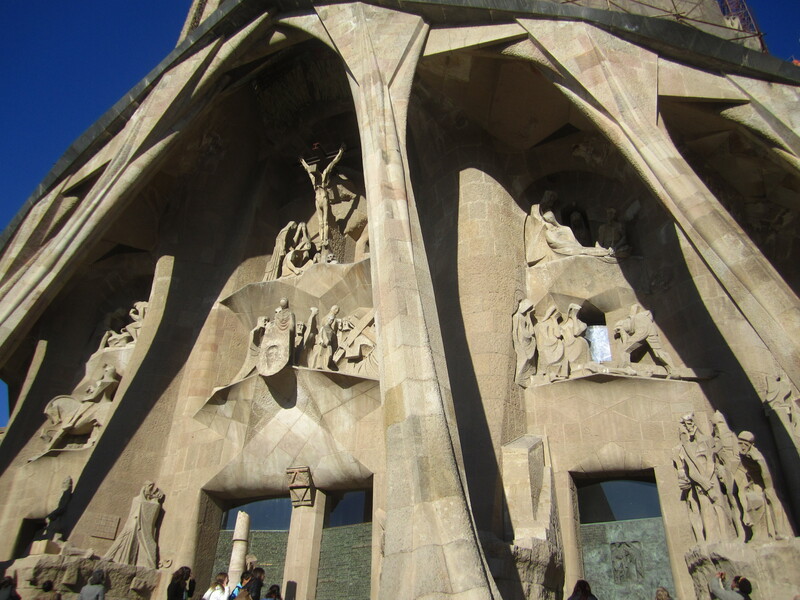 However, it turns out that the only two inhabitants were the Count who was behind the project and Gaudi himself. Again, Gaudi outdid himself with creativity and function coming together to create a tranquil, beautiful and intriguing retreat from the city. Unfortunately, this was my last night with Stacia and Ray. They had to get up and head out early in the morning. I ended up wandering the streets of Barcelona like a lost puppy without them. Luckily, a friend I had met in Nepal came to my rescue. Ana and I hung out for my last few days in Barcelona. She took me rock climbing up in the hills overlooking the ocean. Although my climbing skills are shockingly bad, I had a great time with her and her friends. We also wandered around town, hanging out at some very cool little pubs and cafes and accidently catching the fire breathing dragon portion of the Santa Eulalia festival. However, as with all journeys, this one had come to an end and it was time to leave Spain. And although I was sad to be parting with my beloved Menu Del Dia, I knew that my stomach and taste buds would continue to be spoiled. My next stop was France, and I do love French food! 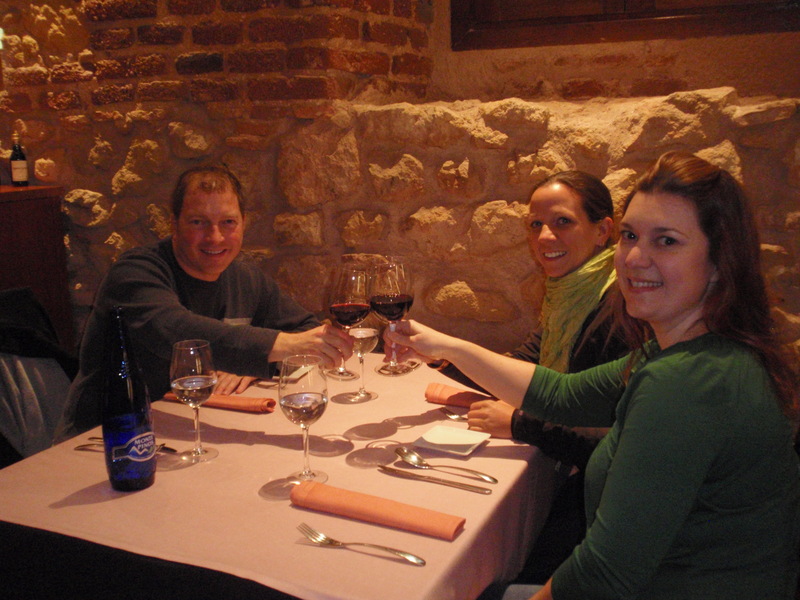 This entry was posted in Europe, Traveling and tagged Food, Friends, Gaudi, Spain, Wine. Bookmark the permalink. 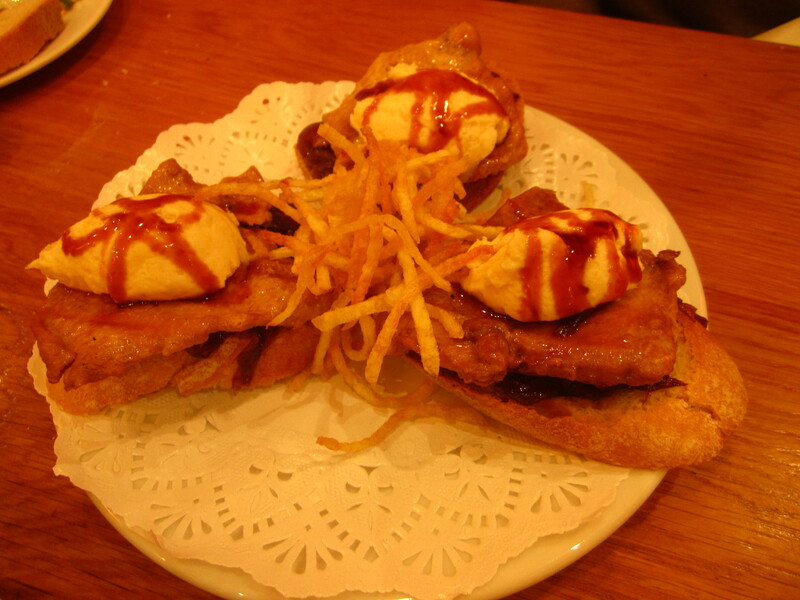 2 Responses to Menu Del Dia, Por Favor – Yummy Spain! Was not a good idea to read your post while being hungry!!! !